60 Degrees of Inspiration : I am not yet comfortable with being uncomfortable but I am getting there! I am not yet comfortable with being uncomfortable but I am getting there! Last year, after reading a lot of good things about it, I tried Jilian Michaels 30 day shred. After trying it for a month I also thought a lot of good things about it. I will need to revisit it this year and "nail it" but before I try it again I bought Jilian Michaels Yoga Meltdown. I wanted something different and something that would rebuild my core strength. I am intending to do the 5x50 challenge again this year. I want to jog faster and stronger so this seemed like a good place to start. I have now done seven workouts with the yoga meltdown. It is interesting and different. It did not wipe me out in the same way as the 30 day shred did even on the first day, but the feeling in my muscles continued through the next day and I made the decision to do it for 3 days and then take a rest day. I think this was wise as I went back on days 5 and 9 feeling better. The structure is not as clear cut as the 30 day shred with the circuits being separated with sun salutations which is not clear to start with. The circuits are well contained and challenging. It is a good mix of moves and by workout 3 I had got into the flow of it Like anything the more comfortable you become with the order the more you can focus on the technique. I love the fact that there are two other people demonstrating the moves at varying difficulties. This is a welcome feature of both workouts. I was concerned it might be a bit gimmicky and it is! There are may sayings that feel like they should grate on you, including "get comfortable with being uncomfortable". Saying that in all honesty I just use them as marking posts throughout the workout. I was not aware of her reputation before getting the dvd so had no preconceptions. She is tough and unrelenting. I am often pleased she is not actually in the room as I have expressed my frustrations verbally at times! The thing is though she is motivating, you get it done. Somehow she picks you up when you need it. I still have a lot of work to do on my technique but I am very gradually getting there. I can do moves now that I could not a week ago. I am intending to continue this level for another week and then try level two for two weeks. After that I will come up with another plan which may be mix and match or the odd back to back who knows! 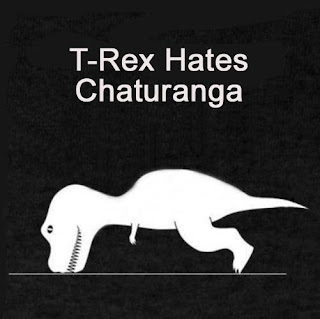 Like T Rex I do not like Chaturanga - but unlike T Rex I will be able do it with practice. I had done some very basic yoga poses on the Wii Fit but that was all. I am enjoying the movement she incorporates. If you are looking for a slow pace then this is not the right DVD. I imagine that somebody very experienced at yoga would want something more challenging in terms of poses but the dynamic aspect does bring something new. My tips would be - 1) make a mental note which leg you are on as you will return for the opposite leg in a few moves time. 2) Make sure you are inhaling and exhaling when you should be. I found it makes a massive difference with the push ups to inhale on the way down (also with the push ups keep your elbows locked in), and finally 3) Paint your toenails and then at least you will smile when you look down to "find the floor" again.